crumblyplum | Food, glorious food! Part of our lives returning to normal after the wedding involves never being home over the weekends. So far we’ve had one trip to my folks in Jo’burg and one to Leon’s folks on the farm. Mostly our time there is pretty much the same as it would be at home and food is still central, with much time spent in the kitchen. The farm where my in-laws live is near Dundee, in Northern KwaZulu Natal. It’s an underrated area of our country I think, it doesn’t have the romance of the KwaZulu Natal Midlands with its dairy farms and rolling green hills, or the food and wine culture of the Western Cape Winelands, but it is the site of historical battlefields from years gone by and there is a certain beauty in the golden fields and forested hill sides. The farm is the site of an old coal mine and the first few times I visited my husband took me exploring. All the old buildings are built from red brick and there was essentially an entire community that lived there – there are the remnants of a school and even a Hindu temple. I’m always struck by how the afternoon winter sun reflects off these red brick buildings – they look as though they are glowing, especially against the backdrop of dry, golden grass that grows around them. 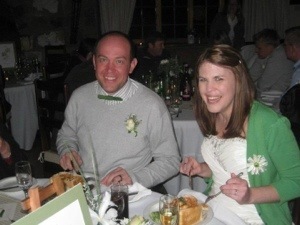 My husband is from one of the South African German communities and my friends always ask what we eat when we go to the farm – “is it traditional German food?” – but the truth is, it’s not so different to what I’m used to. This weekend was probably actually the first time that we had a “traditional” German meal – franks, sauerkraut and potato salad. Not just any franks though – they were home-made in the kitchen at the farm and are far superior to anything you could buy in a supermarket! Every year the church that my in-laws go to holds a bazaar, which includes an extremely popular meat sale. The congregation and any hands they can rope in (ourselves included) work for months beforehand slaughtering, butchering and making a variety of meat products. The operation they have built up over the years is phenomenal and the products they produce are definitely the best I’ve tasted. There is everything from large cuts of pork (oak chip smoked and non-smoked), lamb and beef, to sausages (boerewors, bratwurst, pork bangers, käsegriller), biltong, burger patties and bacon; but the biggest draw card are the deli products – specialties including mettwurst, bierwurst, schinken (unsliced bacon), kassler, ham, pastrami, and paté. Needless to say we aim to stock our freezer for the year! This weekend, while Leon whiled away time in his Dad’s workshop making us a TV cabinet, I helped my mom-in-law finish off the birthday cake / pudding for my brother-in-law’s birthday. On the menu, bienenstich; this translates into bee sting! 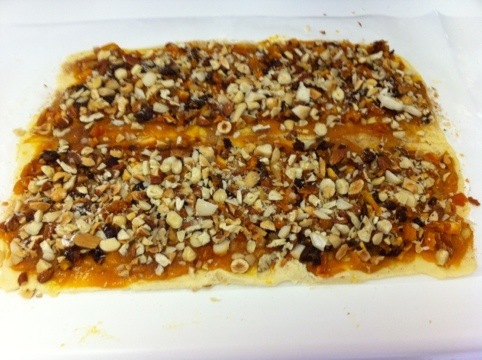 It is a bready cake made from yeast dough that is filled with custard after baking and has a topping of honey and nuts. The cake is springy and quite heavy, the custard sweet and thick, and the topping crunchy and sticky. I’m slowly building up a collection of traditional German recipes, handed down to me by my mom-in-law and from all the women in the community in Dundee at my Kitchen Tea. I’ve a lot to learn, but I think it is really important for these recipes and traditions to be continued in South Africa, even as the community spreads and is more and more diluted by English girls like me. Although from my genetics background the introduction of new genes into this relatively small and close-knit community can only be a good thing! I’ve included the recipe for bienenstich here, I haven’t made it from scratch yet myself, but I plan to soon – if you try it, let me know what you think! Place butter, milk and sugar on stove and stir over a low heat until mixed well. Cool and mix into the dry ingredients and then add the beaten eggs. 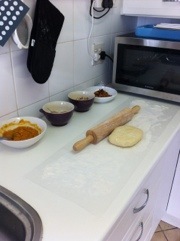 Press into a greased baking tray or cake tin and allow dough to rise until volume doubles. Bake at 200 °C for 15 min, then reduce the oven temperature to 180 °C and bake for a further 15 min. 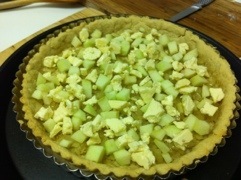 Allow to cool before cutting in half horizontally and filling with custard. 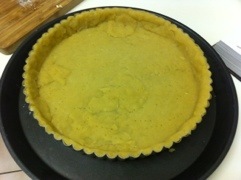 Mix corn flour and custard powder with a little of the milk to form a paste. Heat remaining milk and sugar and then add the custard paste mix. Cook until thick and then add 100 g of butter. 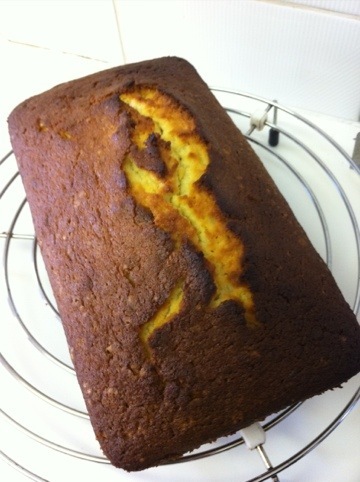 Allow to cool a little and then fill the cake with the custard. Place all ingredients in a bowl and microwave until mixture caramelises and becomes syrupy or toffee like, but at a point that you can still pour it over the cake. Allow to cool a little and then spoon over the cake. Four months. I have spent four months thinking about blogging, wanting to blog, wondering whether I really want to blog and why I haven’t just done it. There is one obvious reason for my absence, a wedding, our wedding. Between the doldrums of work and the all consuming wedding planning little time has been spared for what I want to do. We were a reluctant bride and groom, eager to be married to one another, but not so keen for the wedding that needed to accompany it. As it turns out it was a wonderful, amazing wedding weekend – worth all the effort and time we all (our families were hugely involved) spent in the months preceding the “big day”, but we’re just regular folk who savour the normalcy of our lives together. So that all changes now, we have everything we wanted out of our wedding – our normal lives back! Toasted sarmies on a Sunday night, curling up on our couch big enough for two, watching Grand Designs or the cricket, planning and scheming for our life ahead. He working in his workshop, building us beautiful furniture, me devouring foodie magazines and now, hopefully, blogging again. Not to mention the cooking that started all this in the first place and now we have a house jam-packed with all manner of kitchen goodies to be getting on with. So, here we go again…take two. Hungarian shortbread – after reading the recipe, something I’ve learned to do with every Baking with Julia recipe, these biscuits sounded like the “jam biscuits” my sister loves that were a regular feature in our home growing up. A layer of jam sandwiched between dough and baked – simple and delicious. Packed away into a container...but sitting next to me on the couch! Bad idea...too easy to nibble on! 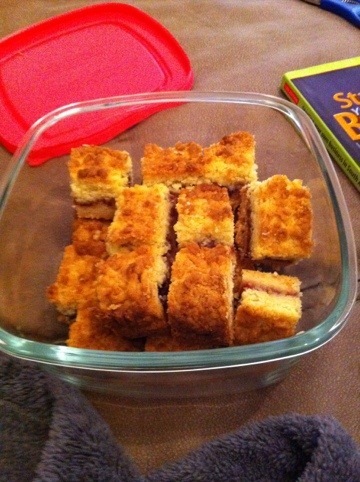 I don’t recall our childhood recipe at all, though I’m sure my sister knows, but based on my memory of “jam biscuits” and the great number of this shortbread that I ate, I would have to say that although the concept is similar, the biscuits are quite different. The biscuit part of this Hungarian shortbread is exactly as the recipe describes – buttery and sandy in texture, while I remember the biscuits of my childhood having a smoother texture. Both, however, have the ability to make me feel rather sick after a few too many, down to that buttery flavour I suspect 😉 I also found the shortbread to be quite crumbly, in keeping with the sandy texture, while “jam biscuits” weren’t if I recall. The other thing the recipe claims about the Hungarian shortbread is that they come together easily and with no fuss – I agree completely, I loved making these! Quite possibly because I got to haul out my Kenwood mixer, who has been staring quietly at me from the corner of the kitchen for weeks, willing me to bake something. I had such a fun Sunday morning baking and I even used the left over egg whites from the recipe to try my hand at meringues, using the Baking with Julia recipe – first time ever and I think fairly successful! The one thing I did do differently was the jam, I cheated and used a store bought whole berry preserve – not one I’ve tried before and a wonderful discovery – it was sweet, but sharp and the whole berries were a welcome surprise in the middle of the shortbread. Did anyone else have a lame hand after all the grating?! Tiring stuff, but it definitely makes for a light biscuit. Oh, and I also pre-baked the bottom layer for 15 minutes, as suggested by a few folks in the P and Q. I think this definitely helped as the bottom was softer than the top because of the preserve, but I think it would have been rather soggy if I hadn’t pre-baked it. Overall, this was a success in the kitchen, and a recipe that will see years of repetition in our home. If you’d like the recipe, head over to the blogs of our hosts for this week – 1smallkitchen and The not so exciting adventures of a dabbler. 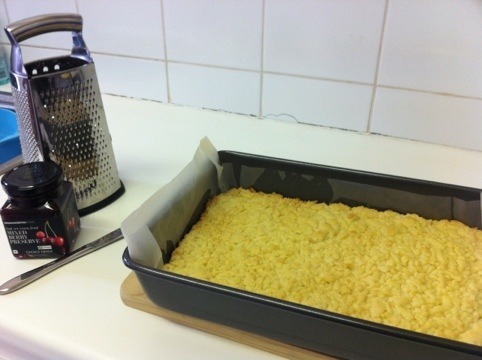 And to check out what everybody else thought of this recipe have a look here at Tuesdays with Dorie. I think I’ve skipped out on the whole of April’s FFwD recipes, but there was no way I was missing this lamb stew. Yes, that’s right, navarin printanier equals lamb stew – a stew (navarin) with spring vegetables (printanier) to be precise. Never mind the fact that we are firmly entrenched in the cool breezes and chilly evenings of autumn here in South Africa; an autumn stew will work perfectly too. 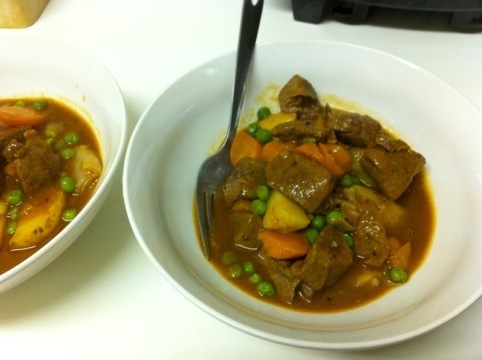 Looking at the recipe it is very similar to the lamb stew I’ve grown up on – sweet green peas, soft potatoes that have soaked up the rich broth and springy carrots, their colour dulled by the cooking time. The little onions will be a new twist I think, as will the initial browning of the vegetables. Turnips are not a vegetable we see readily here and, as suspected, I could not track any down – I substituted with extra carrots. I also substituted the small white onions for shallots, again just working with what was available in the store. The other switch was leg of lamb in place of the shoulder – again thwarted by supermarket availability. I was much relieved to read that The Little French Bakery also used a leg of lamb for this recipe, with good results, despite her initial concerns of stringy lamb. The recipe involves browning the cubes of lamb on all sides, coating them in flour and seasoning, before cooking a little longer and adding beef broth (I tried out store bought liquid broth for the first time), tomato paste, garlic, parsley, thyme and a bay leaf. All of this gets to bubble away on the stove top for 45 minutes, while you prepare the vegetables. The onions are removed from their skin using a nifty little trick – putting them in boiling water for a minute, then top and tailing them – the skin comes off all too easily after this. 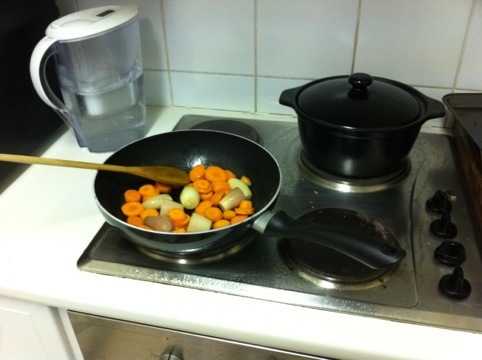 In a large pan, with heated butter, the onions and carrots are sautéed, sprinkled with sugar and stirred constantly for about 10 minutes, until the vegetables brown beautifully. I think it adds a much fuller flavour to the overall dish. Once the lamb has been simmering for the full 45 minutes, the sautéed vegetables and potatoes are added to the pot, and the whole lot simmers for a further 15 minutes on the stove top. After this it all goes into an oven, covered, for 30 – 40 minutes at 200 °C, or until the lamb is tender. At this stage you add the peas, I used freshly shelled ones (the supermarket had something I wanted at least! 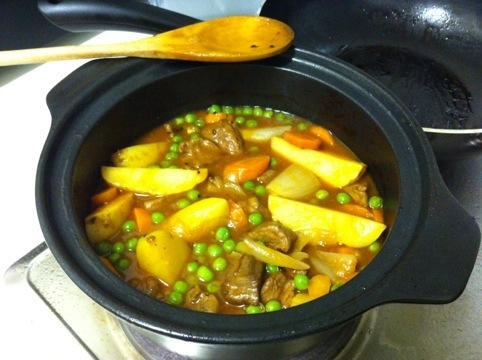 ), which get stirred through the stew for 4 minutes. Season the stew and serve, on its own, and enjoy. PS You can check out all the other bloggers’ experiences of this recipe here. I’ve been absent from my lovely little blog for ages again 😦 I want to blog, I just don’t seem to get around to it between work, wedding and the wonderful public holidays we’ve been having. In the past when I haven’t blogged, I’ve at least still been cooking but at the moment I feel like even that joy is taking a backseat. The withdrawal is apparent I think, the lovely fiancé laughs when I tell him I’m already planning what we’re going to eat on our road tripping honeymoon – any avenue to immerse myself in food! So, this weekend, after having missed many a FFwD and one week of TwD, I decided enough was enough and I was baking lemon loaf! 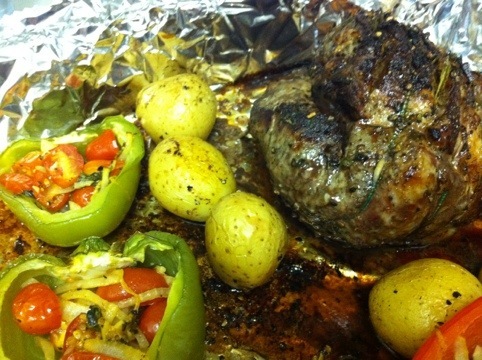 If you’d like the recipe, you can get it off the blogs of the hosts for this week, Truc and Michelle. And to see how everybody’s loaves turned out go to TwD. Easiest bread ever! And pretty darn tasty too, though I was probably more partial to the crust than the inside, which is pretty unusual for me. The second recipe for Tuesdays with Dorie this month and it’s a keeper. This is a bread that has just four ingredients, which were apparently ingredients that every household in Ireland would have on hand – flour (cake flour, in my case, all purpose for the Americans), bicarbonate of soda, salt and buttermilk. All that is required of one to make this bread is to mix all the ingredients together, need a little bit, shape into a disk, slash an X across the top and wait, while it bakes. Then wait, patiently if you have it in you, while it cools, before you cut a great, thick slice of it, ready for spreading or dunking. We ate ours with a store-bought soup (lazy Sunday lunch) and it was perfect for the meal – you could dunk it in the soup and because of its moist, tight texture it doesn’t leave crumbs in the soup! 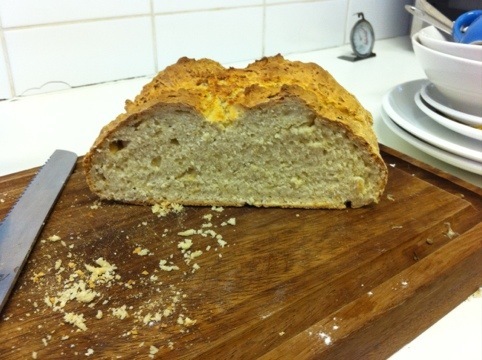 I kept nibbling away at the crust all afternoon; I just couldn’t resist it – crunchy, salty and just a little sweet. The fiancé apparently had a slice slathered with syrup; he reports it to have been delicious. A versatile little bread recipe, which I think possibly lends itself to variation. 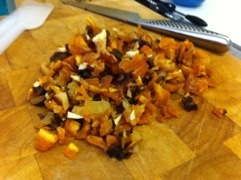 Dorie suggests adding a cup of raisins, currents or diced dried fruit to the mixture for a non-traditional version. I was thinking more like a grated, flavoursome, mature cheddar, and the fiancé suggested cheese and bacon. For me the smell emanating from the oven was reminiscent of baking scones – I think these are known as baking powder biscuits in the States? For us it is the British classic of cream scones with strawberry jam. I think this is why I feel like cheese would be a good addition, cheese scones are a favourite! I know the recipe by heart and will be whipping up this bread often from now on. Amazing! I was pleasantly surprised, it was rich and I couldn’t eat too much, but the flavour was so interesting – not particularly overpowered by apple or the creamy blue cheese, just a wonderful amalgamation of the flavours. It’s certainly not your everyday dish, the pastry takes time, but I’m glad I’ve actually made pastry from scratch now – this cooking group is really teaching me some new skills and pushing my boundaries. I do feel like I’ve been neglecting my own dishes though and I’ll be making a concerted effort to post more of my own stuff, with recipes! 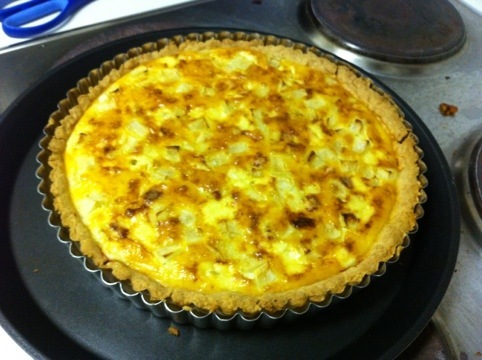 If you’re looking for the recipe for this quiche then check out Dorie Greespan’s book Around My French Table or get in touch. Shoo, the first Tuesdays with Dorie recipe for March really challenged me! 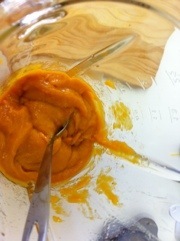 But, it also challenged my brand new, beautiful, shiny Kenwood Titanium Major – so much in love! I was spoilt with a very early birthday present by my lovely fiancé after I’d been boring him with my whining about how all these recipes were so challenging without a stand mixer. For those who are as clueless as I was when I first saw this recipe, rugelach is a Jewish pastry. It is made from a cream cheese pastry, spread with lekvar (a jam or butter made from dried fruit), sprinkled with cinnamon sugar, chopped nuts and dried fruit and then rolled up and dipped in nutty, cinnamon sugar. All this is then baked in the oven until the sugar has caramelised and the smell is more than you can bear! So, how did it go? Well, the apricot lekvar went really smoothly (no pun intended!). I used lemon juice, rather than the amaretto, for no reason other than personal choice. 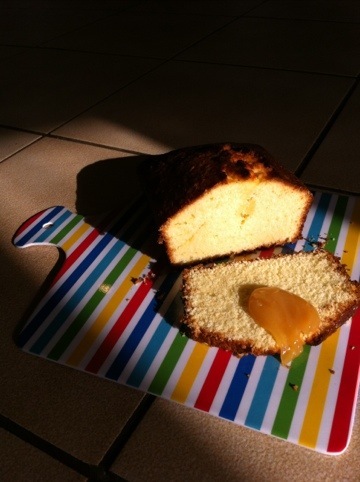 It was quick and easy, and I really enjoyed the sweet yet slightly tart flavour. The cream cheese pastry was super easy in my new mixer, it all came together really easily and then went into the fridge for chilling – there is a lot of chilling in this recipe, so be sure to have lots of time on your hands! Still tidy,before the rolling and filling began! The troubles started when it came time to filling and rolling the dough with its insides up – I don’t see how with the dough at the width that is prescribed in the recipe one can achieve the roll that appears in the recipe book. Partly I think this is my fault for putting too much topping on the rolled out dough, but I don’t think it was the only problem. To me it seemed like if I hadn’t cut the dough in half as instructed I would have had a much better chance of rolling the rugelach up like a wheel. Never mind, I rolled them up as best I could, re-chilled them and then baked them until they looked lovely and ready to eat. 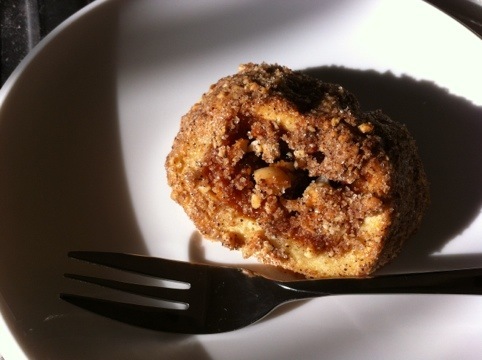 Never having tasted rugelach before it is hard to say whether they taste “right”, but they tasted good – I really like the cream cheese pastry, and the dried fruit and nuts were great settled in amongst the lekvar, all topped off by the sweet, crunchiness of the cinnamon sugar. All that being said, I’m not sure I’d make them again in a hurry – I’m not really a dried fruits kind of girl and they were a lot of work. I think there are way more delicious treats out there that don’t require so much chilling and rolling and prepping! But it’s my own personal thing. As the tame edge of cyclone Irina delivers us with much welcomed rain, we find ourselves with a small respite from the heat and humidity of January and February in Durban. We’ve been able to enjoy our upstairs studio today, which has been uninhabitable for the past few months, and we’re loving it. Music on, creativity flowing and companionable time away from the rush of the world – the temptation to call in rain day for Monday is, oh, so strong, just to keep this feeling a little longer. Of course, while we have this spell of relief, even if it is just the slightest of drops in temperature, we had to feast – soup and homemade bread for lunch and a roast for dinner – indulgences not fit for summers in Durban, but enjoyed all the more for it. 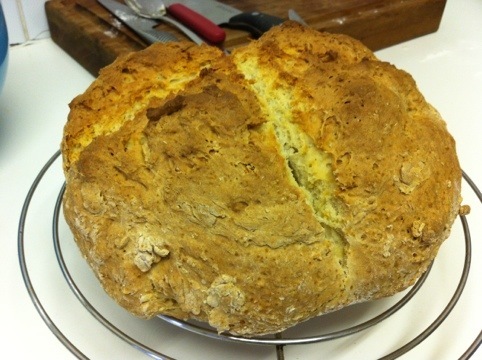 This morning I made the Irish Soda Bread that is up later this month for the Tuesdays with Dorie baking group, I’ll officially post it later this month, but it was so simple to make and worked well with our Woolies soup – sweetcorn and chicken noodle. I particularly enjoyed the crust, but, I divulge too much! We initially planned on a pork roast, but the shops were not forthcoming when we dashed out in the persistent rain this morning. A lovely lamb roast however was a more than adequate and welcome stand in. We thought about slow cooking it in the new slow cooker, but didn’t quite get our act together quick enough – unless dinner at 9 pm was something we were willing to entertain. Not bloody likely! 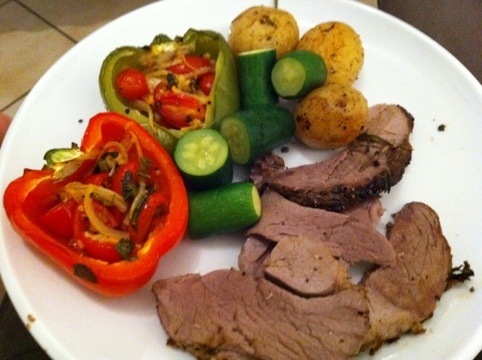 We opted for a simple, traditional roast, but with Greek-inspired flavours introduced via a rub. We added new potatoes (for their low GI properties – still trying to stick with the diet!) to the pan part way through the cooking process, so they could also enjoy a bit of the Greek treatment. In addition we made the chilli and tomato stuffed peppers side from Jamie Oliver, that has become a firm favourite in our house – possibly more Italian than Greek, but that’s just how we role! The lamb was cooked beautifully, if I do so say myself. The thinner parts of the roast were starting to crisp on the outside, but it was still juicy inside and the thicker cut part was almost bordering on a pink tinge and was juicy and tender. The rub forms a tasty crust of the outside that was irresistible, with the rosemary coming through particularly powerfully, as it is want to do. The potatoes also picked up the flavour of the rosemary and the stuffed peppers actually worked pretty well, a fresh tasting compliment to the rich lamb. 1. Mix all the rub ingredients together and allow to stand for a couple of minutes to infuse. 2. 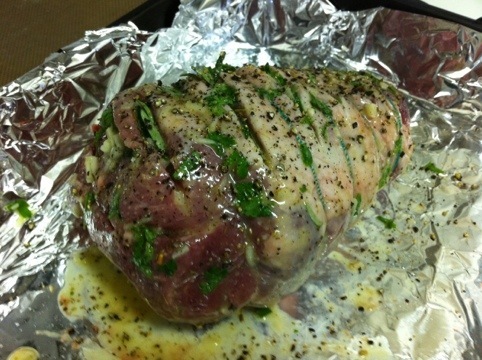 Create slits in the lamb and stuff with sprigs of rosemary. 3. Rub entire roast with the rub. 4. Season with freshly ground salt and black pepper. 5. Roast at 220 ºC for 30 minutes, then turn down to 180 ºC and add the new potatoes. Cook for a further 45 minutes or until done. I’m late, I’m late! There was no way I was going to get this week’s French Fridays with Dorie recipe done in time – it was a crazy busy week, and to be honest, I wasn’t convinced about lentils. Sheepish grin. But then I saw a decently priced and sized piece of salmon (it’s really expensive here in SA) and I decided to be brave. 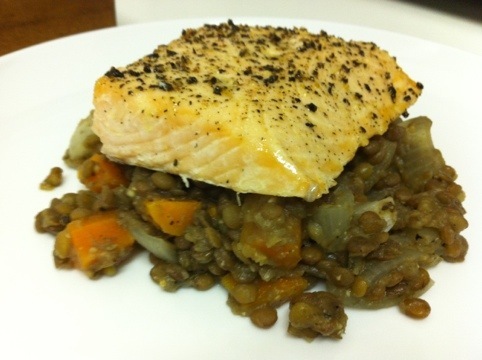 I’m pretty glad I did – it was good, the salmon was so easy (I’d been a little nervous about salmon, cooking fish always makes me nervous) and the lentils were impressive. They’ll be back. Of course, once I had the salmon and I’d decided I was going to give the lentils a fair shot, I had to find lentils! Lentils du Puy, or French green lentils, to be precise. Apparently not so easy – we couldn’t find them and so we went with brown lentils as a substitute. Not sure what the difference is, aside from colour and where they are grown, any ideas? I halved the recipe, at least in terms of lentils, since it’s just the two of us, and I have to say I was amazed at how the lentils grew – for a while I thought we might be filling up on snacks! Anyway, on to the making of this dish… It starts out with a rinse of the lentils, checking for any stones that may have been missed in the sorting process, and then a quick boil and another rinse. The lentils are then joined in a pot by some chicken stock, a whole onion with a clove embedded in it, some chopped up carrots and celery. A familiar soup base, nothing scary there. This simmers until the lentils are tender and then the stock is drained and reserved, the veg is chopped up and a quarter of the lentils are pureed and added back to the remaining lentils and veg. After the lentils have finished cooking and before you puree them, the salmon is seasoned and roasted at a high temperature for 12 minutes. Twelve minutes! Excellent. We enjoyed it, we’ve learnt that we like lentils (good news for the diet, since they are low GI!) and I can cook salmon, it’s not so scary anymore!